A small group of cartographers at swisstopo are specially trained to update the hillshadings for all the maps in different scales. Until the end of the 21st century, the swisstopo cartographers airbrushed their shaded reliefs with black ink on aluminium laminated paper. Nowadays the digitized manually produced shaded reliefs are efficiently revised in Adobe Photoshop with a Wacom pen. Cartographer Eduard (Edi) Geissbühler working with an airbrush. © swisstopo. 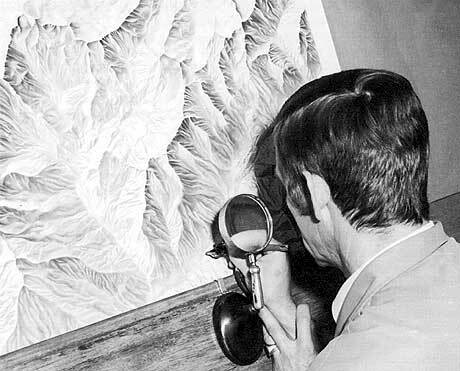 Paul Witzler (1913–1998), apprenticeship as cartographic lithographer at Hallwag, afterwards employed at Kümmerly+Frey from 1935 to 1937 (as relief specialist); worked at swisstopo from 1937 to 1978 (responsible for the federal map 1:100 000, relief specialist, since 1961 chief manager of the relief cartography department). Fritz Häfeli (1913–1990), apprenticeship as mercantile lithographer (other sources: typo-lithographer), professional training in Vienna, employed in miscellaneous reproduction companies, afterwards employed at Kümmerly+Frey from 1943 until 1945; worked at swisstopo from 1945 to 1978 (specialist for relief and rock representation; furthermore responsible for the Atlas of Switzerland for nine years). Eduard Geissbühler (1922–2011), apprenticeship as engraver at swisstopo from 1938 to 1942; employed there from 1942 to 1987 (since 1958 as relief specialist – it is said that half of all federal map relief shadings have originated from his airbrush), chief manager of the relief cartography department since 1978. Paul Ehrlich (born 1949), apprenticeship as cartographer from 1966 to 1970 at swisstopo. Afterwards cartographer at Hallwag and Kümmerly+Frey (1970/71); from 1971 to 1976 cartographer at Map Studio in Johannesburg, South Africa. Return to Kümmerly+Frey from 1976 to 1978. Job change to swisstopo in 1978. Training as relief specialist by P. Witzler and E. Geissbühler. Apprentice supervisor for many years. Manufacture of countless original reliefs at the scales 1:25,000, 1:50,000, 1:100,000. In 1987 creation of the original relief Mount Everest at 1:50,000. 1992/93 relief original of the “Carte du relief des Alpes” at the scale of 1:1 million, additionally personal creation of the contour base map with uniform equidistance. In 2008 relief original of the new ice age map for the federal geology department. First and hitherto only original digitally created with Photoshop. Inbetween creation of the relief original for the hiking region Squam Range. He retired in 2014. Rudolf Morf (born 1955), apprenticeship as cartographer at swisstopo from 1972 to 1976; working experience as cartographer from 1976 to 1978 at Kümmerly+Frey and as survey draughtsman from 1978 to 1985 in Lugano. Returned to swisstopo in 1985. The trainingship as relief cartographer was completed under Paul Ehrlich at swisstopo at the beginning of the 1990s. Morf created about twenty swisstopo reliefs at a scale of 1:25,000 by airbrush on silver bromide paper (e.g. sheet Alpnach). Furthermore he revised numerous reliefs at different scales.